I am trying to write a python macro for ArcGIS 10.2 that will automate the process of labeling points in a layer based on different types of apartments. For example, one style of apartments would have a blue square with white bold text as one label; another would have a pink square with black bold text; another would have a red square with a white bold text, etc. What expression or function would you use in arcpy to alter the style of these labels? Currently, the script labels the apartments by a map code and changes its name in the TOC to apartments, as it should. Now I want to change the font, graphic, and size of the labels to look make a unique label for each, and then make a button to press and simply automate the process any time we have to do one of these layers. Is there any way the fonts, labels, and graphics can be changed with the use of Python scripting (ArcPy, IDLE, etc.)? I have tried using the lblClass.expression function, however the code I am trying to use doesn't work. I figure that is probably the step in the right direction. Below is some code that I've tried to use just to get the labelClass.expression to change the fonts of the labels. return "<FNT name = 'Arial' size = '12'>" & Code & "</FNT>"
The arcpy.mapping API only provides access to a limited number of layer properties that can be directly modified but all properties found in the Layer Properties dialog box can be modified using the UpdateLayer function. The information is extracted from a source layer and applied to the layer in a map document that needs to be updated. The source_layer can either be a layer (.lyr) file or a layer within a map document. UpdateLayer is a robust function because it can be used in several different ways to produce different results. You need to create the symbology/labels how you want, and save it to a layer file. 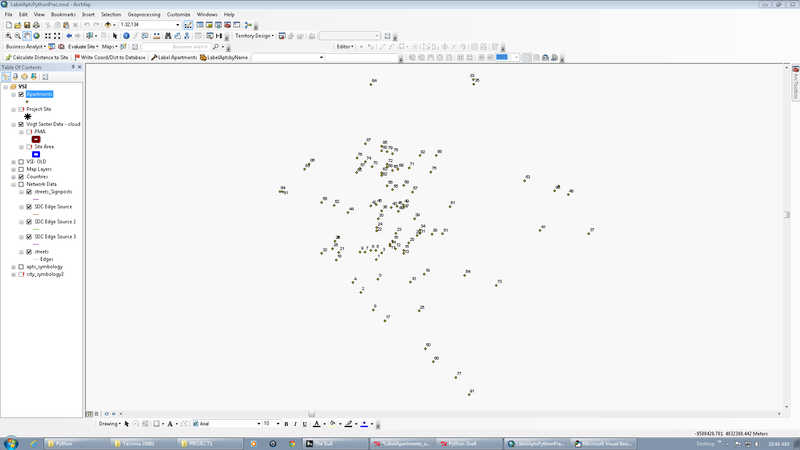 Then load that layer file using arcpy.mapping.UpdateLayer(). If multiple people need to run the python add-in, then you need to make the layer file accessible to everyone, such as a public network drive. 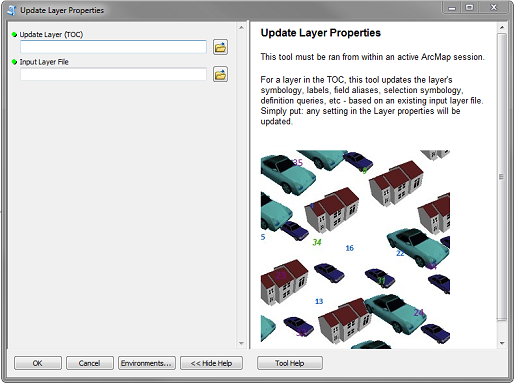 I ended up making a custom Update Layer Properties toolbox. 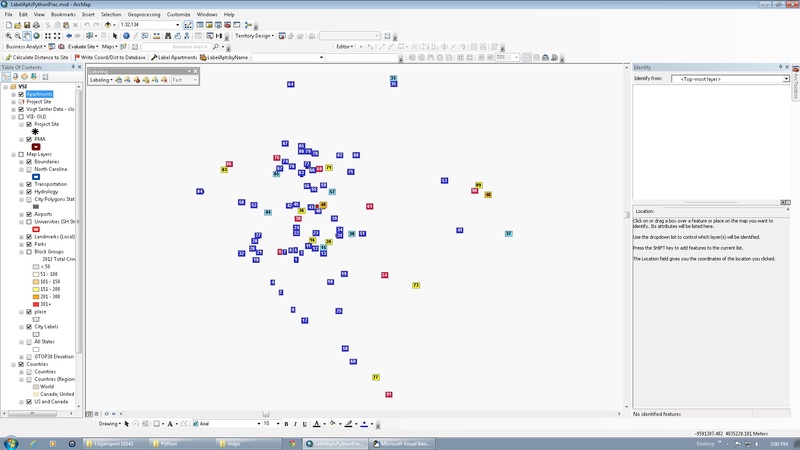 It allows you to select a layer in the ArcMap TOC, and then select an input layer file. It then updates the layer with all the properties within the layer file, and re-sources back to the original feature class. It will work with data that's in gdb, mdb, shp, or sde. return "<CLR red='255'><FNT size = '14'>" + [NAME] + "</FNT></CLR>"
return "<FNT name = 'Arial' size = '12'>" + Code + "</FNT>"
You can remove your other line statements (for loop, labClass, and call to function). Also, the function needs to be called FindLabel. Not the answer you're looking for? Browse other questions tagged arcpy arcgis-10.2 labeling idle or ask your own question. Connecting vector label size with map-units?